I woke up in the middle of the night last night thinking about how I got to where I am now and what others can learn from my story. I typed out ten different lessons on my new iPad that I think will resonate with anyone, regardless of age and profession. If you think of additional lessons, please leave them in the comments. 1. Networking is about them not you. The typical approach that people take when it comes to networking is being a “taker”. They are looking to use people in order to advance their careers. That approach never works and it certainly doesn’t work in today’s connected world. I constantly get emails asking for me to promote people and it’s simply ineffective. I’m not the only one who disregards people who act like this, almost every other successful person does as well. About six or so years ago, I was on a call with a New York Times journalist and instead of asking her to write about me, I asked what I could do for her. She was caught off guard because most people are just looking to use her to get press. As a result, she’s more inclined to help me accomplish my goals. The lesson is to help others first before asking for something in return and it’s at least 50% of the reason why I’m where I am today. 2. Nothing comes easy. While millennials are stereotyped as being entitled, my career is quite the opposite. I started working when I was 13, had my first internship during my senior year of high school, seven more internships during college including my own small business, over three years at EMC including getting Six Sigma certified while creating the first social media position, and now two books, a magazine, two blogs, a podcast, speaking, consulting and the list goes on. Nothing has ever come easy to me and it’s a thrill to have to face odds and overcome them. It’s hard to appreciate anything that comes easy to you. You need to put the effort in and as long as you work smart, not just hard, then you will achieve results. You just can’t give up and have any regrets in doing so. 3. Brands open doors. I first understood the power of branding when I was in my final interview for a marketing position at EMC. The interviewer glanced at my resume and immediately asked me about my experience at Reebok. I didn’t get any experience at Reebok, but I had a lot of experience at smaller firms that were listed on my resume. Reebok is a brand that the interviewer was familiar with so immediately he was interested in it. Perhaps, he even wears Reebok shoes when he exercises too! Through my association with Reebok, I gained credibility and was more trusted by EMC. If you work at IBM and you make a cold call, you have a much better chance at closing relative to a salesperson from a startup. The best reason to create a brand, from my experiences, is to get people to take your calls and answer your emails. 4. Success begets success. The reason why I believe people say that “life is unfair” is because if you’re not already successful, no one will invest their time and money in you. I know this because when I first started out, very few people would give me the time of day and now, people want to surround me. From no one answering my emails to being surprised if someone doesn’t respond is a major difference. When a musician “breaks” into the business, they are successful and thus people want to work with them to leverage their brand and success. If your company is in high growth mode, then investors will come running. If you don’t have a proven product, you will be ignored. You really need to figure out how to show some level of success if you want to make it in this world. 5. Failure guides you to success. I would say that the more mistakes I make, and I still make them, the more I realize what I should be doing. Furthermore, I’ve realized what I don’t want to do with my business and career. Building a business with hundreds of employees isn’t for me and I’ve realized that because I’ve had employees and it just doesn’t seem to work out. The more I fail, the more I realize what I’m meant to do and where I should invest my resources. Failure, to me, is a compass that has guided me in the right direction. 6. Sometimes you have to remove people from your life. My parents always told me to “be friends with everyone” but I think they should have just told me “be nice to everyone” because you never know who will become what (a job seeker could become a CEO eventually). I’ve removed a few people from my life over the past five years and it’s been a great decision for me because it allows me to concentrate on the people that I really care about. Why did I remove them? They were overly jealous and had major emotional issues that wouldn’t go away and it started to bring me down. The people that surround you influence who you become so select wisely. Also, don’t be afraid to let one go because you don’t want to let people tear you down, it’s just not worth it. 7. It only takes one. I’m not inspired as much by other people as you would think. What inspires me is what I call “The Rule of 1”. It only takes one opportunity to change your life for the better and you can build so much from there. For instance, when I was trying to get a research sponsor for my book, I pitched about a hundred companies and everyone said no except for one. I was able to leverage that one company to help secure a book deal with a tier one publisher. One “yes” is a game changer for anyone. Think about an entrepreneur who gets one company to sign on as a client. That client can become a case study which can be used to grow the business. All the energy and stress you go through to get one “yes” is worthwhile so don’t give up. 8. Money is a means to an end. At least for me, money doesn’t make me happy at all. What money does is buy you freedom, which allows you to do various things that will turn into happiness. I’m in a unique and fortunate position because I’ve been able to make money doing what I love for years now. Sometimes you have to take on a project or a job that isn’t glorious but it will produce income that you can leverage to start new projects and buy yourself time to get a more appropriate job. If you think of money as a means to an end, you will be more fulfilled and happier at anything you do. 9. Your authenticity is a filter. I’ve preached about personal branding for years now and one thing I tend to mention is that if you put your true self out there, you will only attract the right opportunities. Brand yourself for the career you want not the job you have. If you position all of your websites, blogs and social network profiles for the career of your dreams, you will start getting opportunities that align with that. If all you do is position yourself as XYZ worker at XYZ company, then you will keep getting opportunities that aren’t a fit. Your authenticity will help you attract the right people in your life too. If you don’t be yourself, people will see through you and you will get passed over or avoided altogether. 10. Every day counts. People get so amazed when they see someone on TV or they walk past a celebrity on the street. What people always look past is the amount of work that person spent to get there. I finally appeared on Fox Business last week but it took me years to get on. If you spend every day accomplishing one task, then by the end of the week you’ve done a lot and by the end of the month, think of what you can do. Don’t waste time, act now! 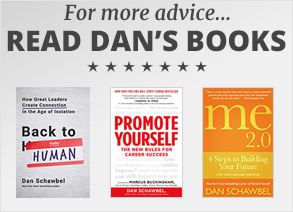 Pre-order Dan Schawbel’s highly anticipated new book, Promote Yourself: The New Rules For Career Success. « Should Non-Compete Agreements Be Illegal? Very wise advice, Dan. Many people will benefit from this information. Thanks for sharing it. Great piece Dan! I especially resonate with #6: Sometimes you have to remove people. I’ve learned this as well that you really become who you spend time with, so its critical to surround yourself by people who matter to you now. Don’t be so hard on myself. Building a business is a journey and every failure opens up new doors to be creative. A bad decision is better than no decision. Acting matters. See you in Boston soon! Dan this statement resonate with me.One “yes” is a game changer for anyone. When I left my job at the bank and started a management consulting firm it took me months to sign on a client fortunately for me one of my clients in the bank signed me on and that was it. The one project was a big one and opened many other opportunities. Nice write up. I would like to add more based on my experience. 11. Never forget people who fostered you during initial steps towards success. When you become successful and known, even strangers will start recognizing you. You have tons of money, freedom and everything is possible. What you probably miss is – friends/people/relatives from old days, who dedicated their time when you were NOTHING. I tend to give equal priority to those people as they deserve my attention in every respect. Lastly, these people NEVER talked to you for fetch benefits out of you. Spot-on, Dan. Not only is this advice hugely valuable — and feels like it’s culled from your hard-won experience — it is for everyone….in any stage of life, in any industry, at any moment. Terrific post. And yes, one YES is a game-changer. Thanks for this great article. As a yoga teacher for many years now and one who trains new teachers, I always focus on ( even though it can be hard) “authenticity” versus someone else’s style or something you feel will attract people. That never holds out in the long term but it’s easy to be swayed. There so much good stuff here. Especially the idea about the one company making a difference in your success. Thanks! Great piece! My favorite one was the authenticity filter: if you put your true self out there, you will only attract the right opportunities. My question, though, is that at an early stage of a career/ life, how do you figure what what your “true self” is? I am 22 and I am not sure how I can express a consistent AND authentic career message to the world since I have such a broad interest. Thanks. Dan you hit the nail on the head 10 times in a row. This is a great piece that is a good reminder for seasoned professionals and should be mandatory reading for someone just starting their career. My favorite one was “Sometimes you have to remove people from your life” but lessons number 1 and 9 are great too. Sometimes the people that seems good actually they are not. I should have read these lessons for about 4 years ago. Perfect for a Monday morning …the networking week lies ahead! Thank you, Dan. 11. Get a mentor in your chosen field – There is somebody somewhere, who has already made it in your chosen field. Instead of making the same mistakes they did, learn from them and make your own mistakes. 12. Give back to the community. Great article Dan, some of the things I had already done, like getting rid of people that are not going anywhere or not adding value to one’s life. asking yourself. There, you can confidently sign up with several agencies, apart from having more chances of landing a new job. his or her skills and education. Regret only shortlisted will be contacted.